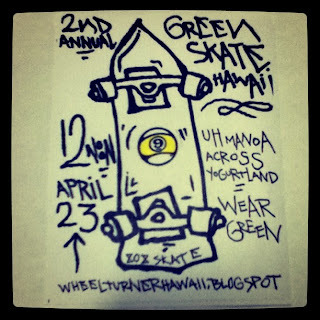 This years GreenSkateHawaii is going to go just like last years. 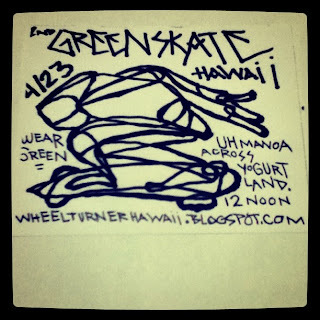 We will be meeting at UH Manoa across from yogurt land and pushing as a group to Kakaako park using the bike lanes/right side of the road exercising safe skateboard commuting skills. Here in Hawaii skateboarding is frowned on, and we need to show that it can be done safely while still having fun. Especially with the rapid rise in gas prices, what better time to use your alternative energy vehicle. 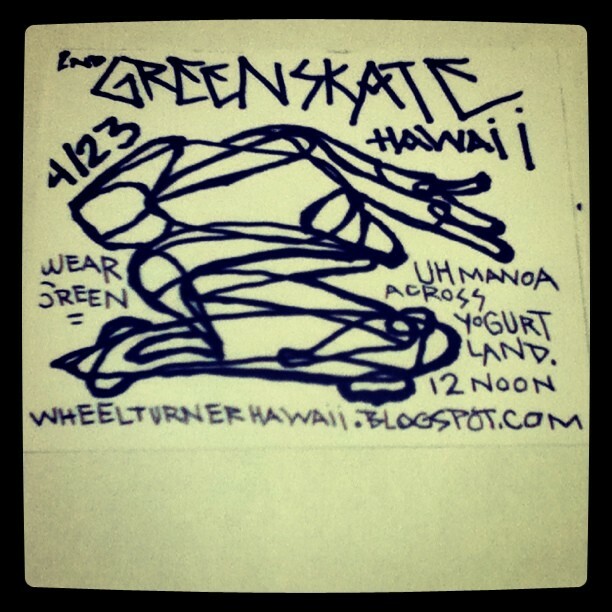 We will be having a skate jam/bbq at the Kakaako park water front hills following the push. 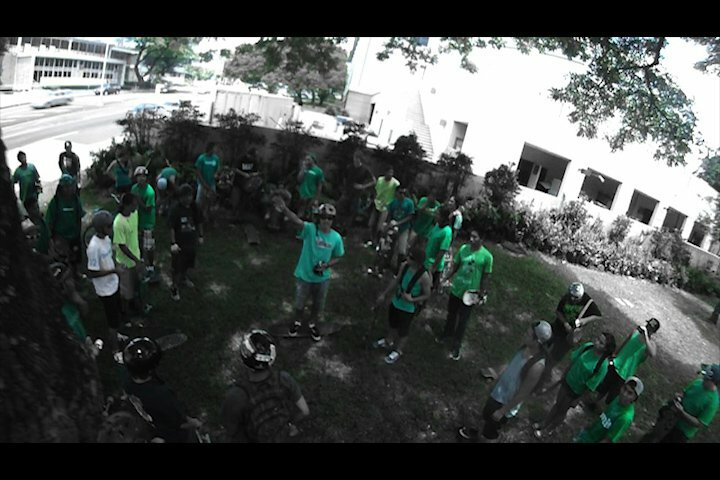 We got some free schwag from SECTOR 9 and 808 SKATE to give out at the end so be sure you make it all the way! We are asking that everyone please wear a helmet and a GREEN shirt. Meet under the tree at UH Manoa across from Yogurt Land at 12 noon. We will start the push at the intersection of University Ave. and Metcalf St. We will follow University Ave. downhill for a while untill we reach Kapiolani Blvd. The whole way to this point there is a bike lane...PLEASE STAY IN THE BIKE LANE. Take a right on Kapiolani Blvd. This road is usually very busy, please skate the sidewalk for this short period. We will stay on this street untill we get to the intersection of Kapiolani Blvd and Mc Cully Street. There will be a shopping center on the corner. DO NOT PASS THIS INTERSECTION. Take a left on Mc Cully St. and take the bike lane once again untill you see the Ala Wai walking path opening next to the bus stop on the right. Aprox. 50 yards. Take a right onto the path and skate along the Ala Wai untill Kalakawa Ave. Cross the street safely and continue onto the walking path next to the convention center. This path will bring us to Ala Moana Blvd. 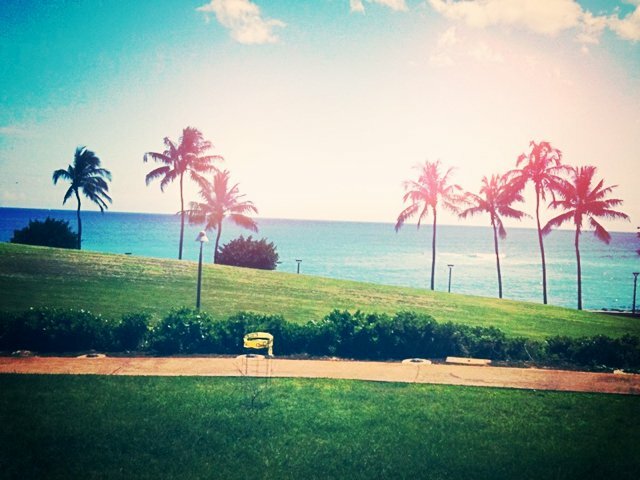 Take a right onto Ala Moana Blvd. and follow it to the next stop light. This is the light that meets with Atkinson Dr. and Ala Moana Park Dr. Take a left here into Ala Moana beach park. We will cruise along the ocean through the beach park and connect through Kewalo basin boat area. 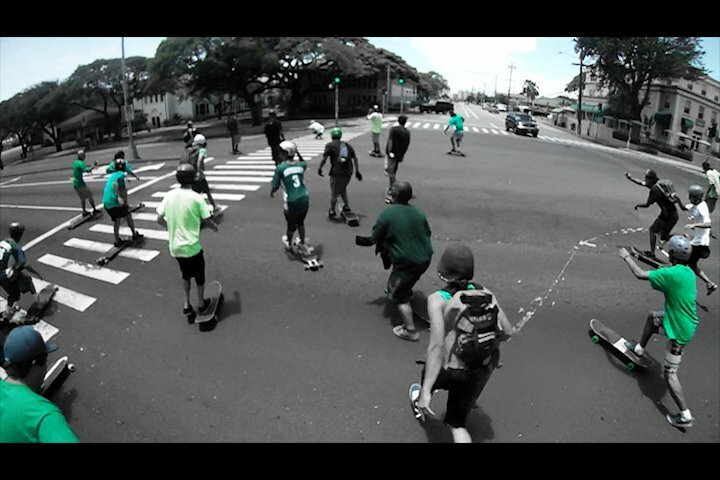 Skate through the harbor and then take a left at the Fisher mens Warf which is on the corner of Ala Moana Blvd. and Ward Ave. Skate on Ward Ave. and take your first left on Ahui St. Follow Ahui St. all the way till the end till you get to Kakaako Park. When getting to Kakaako, skate along the the ocean untill you get to the restrooms, turn right and we will be finishing on the center hill that has the spiral paved path to the top. REMINDER. SKATE AT YOUR OWN RISK. PLEASE USE A HELMET. STAY IN BIKE LANES, ON THE RIGHT SIDE OF THE ROAD, AND ON SIDEWALKS. 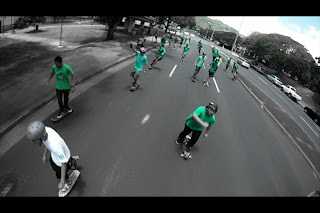 OUR GOAL IS NOT TO BE REBELLIOUS, IT IS TO RAISE AWARENESS OF THE SKATEBOARD BEING USED IN HAWAII AS TRANSPORTATION. WE ARE ON A ISLAND AFTER ALL! Today is April 20th... 420! Here on Oahu the annual 420 Tantalus bomb went down. 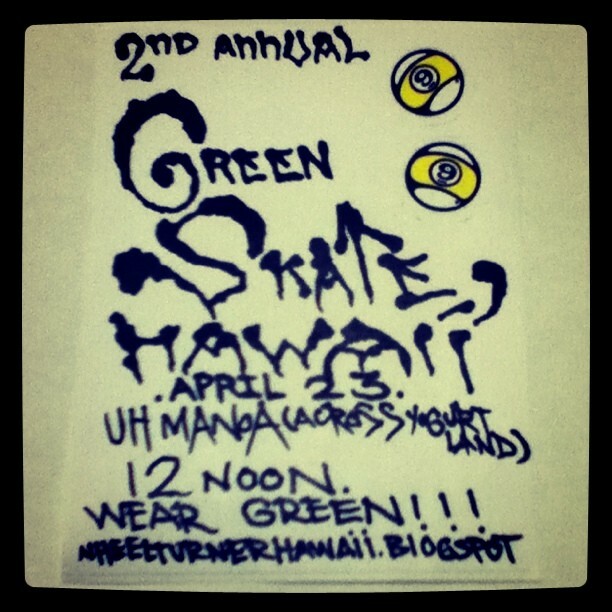 This event has been going on for 10+ years now on and has owned up quite the name in Hawaii. 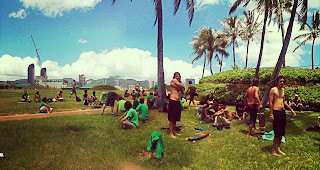 Every year, Tantalus, 420. @ 420. Since before i took longboarding serious id hear about the 420 bombers and see them on the local extreme sports tv show. Because of this the Honolulu police department keeps close watch on the hill, and have shut down the bomb several times. This year the skate couldn't have went better. 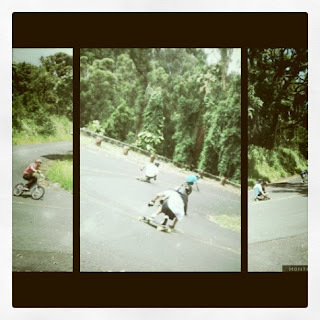 20+ skaters were on the sunny, dry hill, ready to skate. We all got to surf the hill together in close packs. Got to do two runs, both were EPIC. The best thing of all, after the two runs... there were still no police in sight. Did they give us this one???.. and to go along with that there were no bad injuries. After a good skate like that we had to finish off our 420 with a nice swim at a local waterfall and some good grub. Today is like a holiday for me. I look forwards to bombing with that big pack of Hawaii skateboarders all year long. 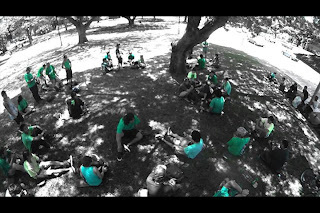 The great green our aina provides is just the icing on the cake! 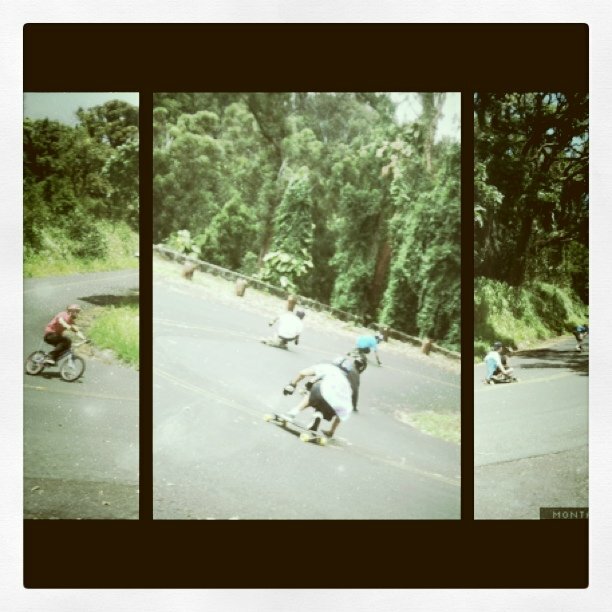 Big Mahalo to Darryl for getting this great day of wheel turning together! More photos and video to come soon! This years GreenSkateHawaii is going to go just like last years. We will be meeting at UH Manoa and pushing as a group to Kakaako park using the bike lanes/right side of the road exercising safe skateboard commuting skills. 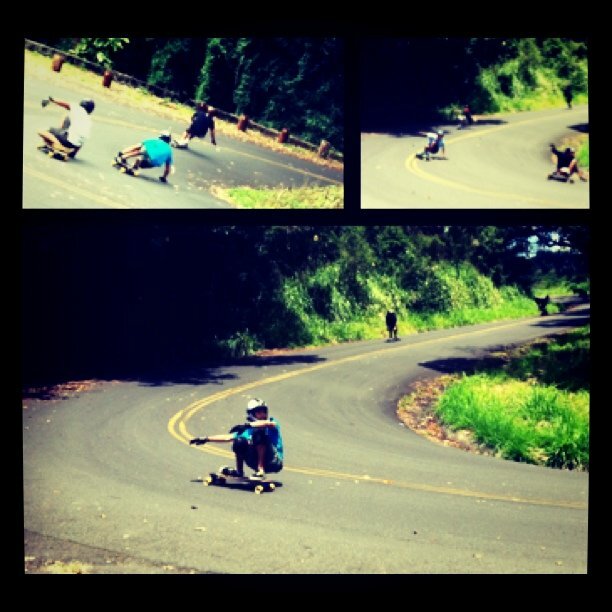 Here in Hawaii skateboarding is frowned on, and we need to show that it can be done safely while still having fun. 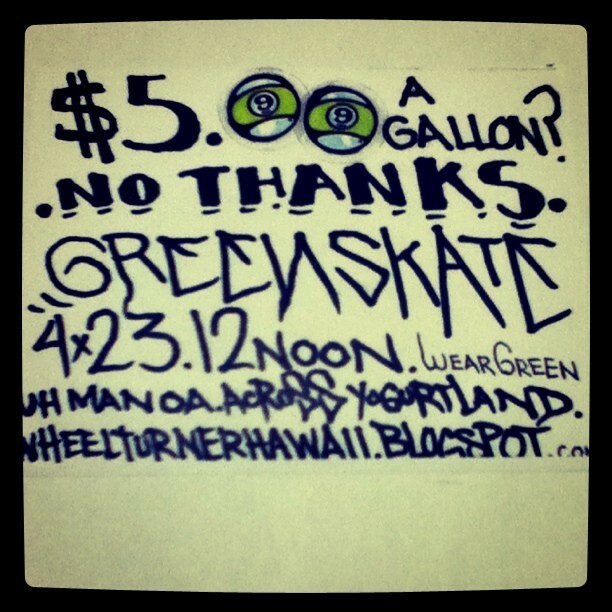 We will be having a bbq at Kakaako park water front following the push. We are asking that everyone please wear a helmet and a GREEN shirt.